Amy loved cruises; she discovered she loved champagne on our first cruise which was to Bermuda. One of my sisters is a travel agent and she would search for the best deals each year. This year, both of my sisters got a sweet deal on a cruise which departed from Florida in the spring. In fact the deal was so great that they decided to go on back to back cruises over the course of two weeks. Of course, they invited my husband and I, but we could not bring ourselves to go on a cruise without Amy. Our hearts were just too heavy! My sisters were both still grieving Amy and so my youngest sister decided they would do something in memory of Amy on the cruises. After brainstorming for a way to honor Amy, she came up with preparing a message in a bottle! She spent many hours searching the internet for the best way to prepare and launch this bottle into the ocean. Once she came up with a plan, she shared the idea with my other sister who eagerly agreed to create one too. Actually, there were 3 bottles created and thrown into the ocean at 3 different locations. Thank you, Sisters! Was cleaning the beach today and found your note. It washed up on Bookies Beach, near Little Harbour, Great Abaco Bahamas. It is close to where some of my brothers ashes were put in the ocean. I am sorry for your loss, she is beautiful, as was my brother, his name was David. Will repack the note and send it on an outgoing tide, with love. You know, it makes perfect sense to me that the bottle would land in a spot where possibly someone needed to find that message of love. It also makes sense that this grieving brother would take the time to respond and return the bottle to the ocean in an effort to continue it’s journey in Amy’s memory. And you are right, Michael … One Love! Remembering David . . .
← One Year Of Unimaginable Pain! What a beautiful story Dee! That’s your Amy bringing yet another grieving person into your life. You put so much love out there and now it’s being returned. Thank you Sheri, but Amy is the loving one. 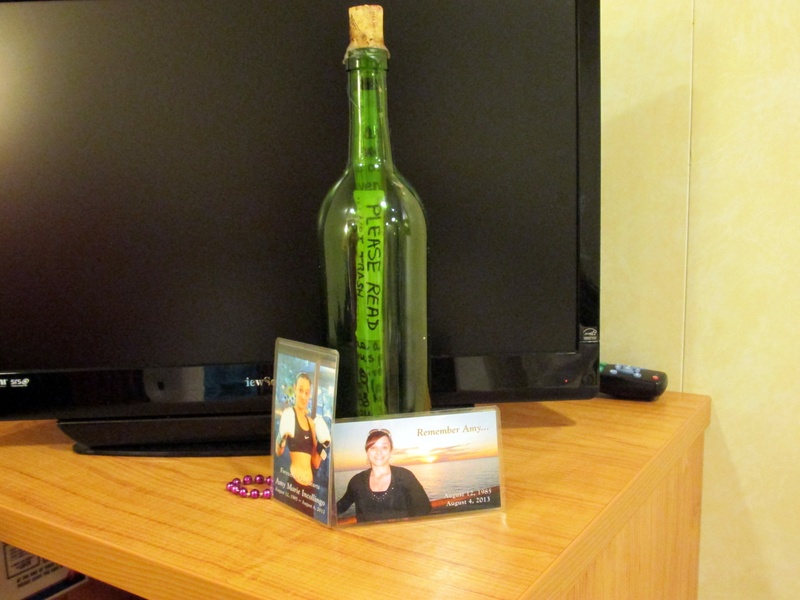 Amy was a hopeless romantic and would have loved the message in a bottle exchange. Btw: I finally mailed Darcy’s package last week. A poignant encounter. You are doing as much as anyone can to ‘Remember Amy ‘. John: Danita came up with this way to remember Amy! Grateful to Danita and Doenee for all they do to honor Amy in so many ways!